This latest build gives you more control over your collision settings in CryENGINE. Under the CryENGINE 3 preferences tab, you will now notice a Collision Default setting with On/Off as your choices. This means that if you didn't explicitly set your components & groups to a collision type, it will default to this setting. This also means that you will see "Default" as the default value in the collision dropdown for the geometry properties window. As a footnote to CryENGINE 2 users, this switch also works for CryENGINE 2 even though it is located in the CryENGINE 3 tab. 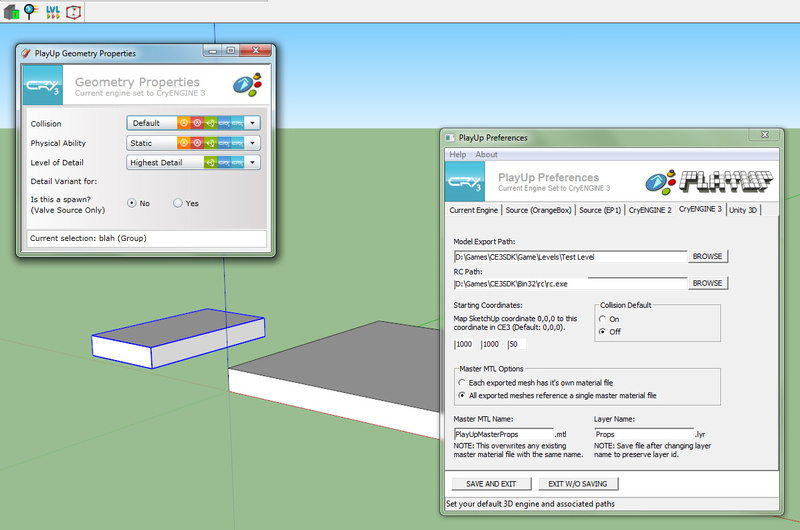 As PlayUp do not have a versionless "CryENGINE" tab, it was easier to let it control both for now than split it. This patch should fix a lot of the more recent collision issues people have been reporting from the last patch. Let me know if you are still experiencing problems, and have a Happy Chinese New Year!